Carl William Mays was born on November 12, 1891, in Liberty, Kentucky, one of eight children. The family soon moved to Mansfield, Missouri, where Carl’s father William was a traveling Methodist minister. After his death when Carl was twelve years old, Mays’s mother moved the family to Kingfisher, Oklahoma. It was there that Carl met his cousin, John Long, a catcher who introduced him to the game of baseball. In 1912, Mays signed with Boise, Idaho, in the Class D Western Tri-State League, for $90 a month; he finished the season 22-9 with a 2.08 ERA. He played the next season in Portland, Oregon, and in 1914 was drafted by the Providence Grays, a team the Detroit Tigers owned in the International League. During his stay with Providence, the Grays were sold to Red Sox owner Joe Lannin. Mays’s 24 victories led Providence to the 1914 IL pennant; in the final month of the season, he was ably assisted by Babe Ruth, who had made his debut in Boston that summer. The two young men were called up for the final week of the Red Sox’s season, but Mays did not appear in any games. Mays joined the Red Sox staff in 1915 and made his debut on April 15. During the Red Sox’s pennant-winning season, he was used mostly in relief, appearing in 38 games. He went 6-5, with a 2.60 ERA, and (though the statistic hadn't been invented yet) led the league with seven saves. He did not appear in the World Series. Mays’s abrasive personality grated on opponents. In his rookie season, Mays often sparred with Detroit’s cantankerous outfielder Ty Cobb. In one game, after Mays threw high and inside on Cobb, the Tiger laid down a bunt along the first base line for the sole purpose of spiking Mays and cutting his leg. Though bitter rivals — the Red Sox and Tigers battled for the American League pennant that season — the men held a grudging respect for each other’s single-minded pursuit of victory. In 1916, Mays split his time between the rotation (24 starts) and bullpen (20 other appearances), winning 18 games and posting a 2.39 ERA. In that fall’s World Series against Brooklyn, Mays recorded a save in Game 1 — bailing out Ernie Shore by recording the final out with the bases loaded and the tying run on third — and was the losing pitcher in Game 3, the Red Sox’s only loss in the series. Mays would often berate his fielders for making errors behind him. “I have been told I lack tact, which is probably true,” he said. “But that is no crime.” Late in his career, Mays praised another pitcher: “This fellow has no friends and doesn’t want any friends. That’s why he’s a great pitcher.” He could have easily been talking about himself. Mays got an incredible amount of outs via ground balls, especially with the Red Sox. 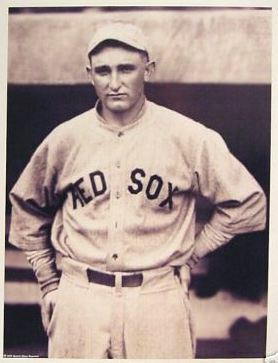 From 1916-18, he recorded 117, 118 and 122 assists, which remain the top three season totals in Red Sox history. In 1918, Mays, then 26 years old, was the ace of the Boston staff, winning 21 games with a 2.21 ERA. He tied Walter Johnson for the league lead with eight shutouts and tied Scott Perry for the lead with 30 complete games. He finished fifth in strikeouts and fifth in fewest hits allowed per nine innings. He also hit 11 batters, the second-highest total in the league. Mays started and completed Games 3 and 6 of the 1918 World Series against the Cubs; Boston won both games by a 2-1 score. Seven days after he pitched the Red Sox to the World Series championship, Mays married Marjorie Fredricka Madden, a graduate of the New England Conservatory of Music whom he had met at Fenway Park during his rookie season. But things went downhill for Mays in 1919. While he was at spring training, his farm house in Missouri burned to the ground; he suspected arson. During a Decoration Day series in Philadelphia, when Athletics fans were pounding on the roof of the visitors’ dugout, Mays threw a baseball into the stands, hitting a fan in the head. He also ran into a lengthy streak of bad luck on the mound, as the slumping Red Sox gave him almost no run support. Over a 15-day period in June, Mays lost three games by a combined score of 8-0. The last straw came on July 13, during a game against the White Sox. When Eddie Collins tried to steal second base, catcher Wally Schang’s throw hit Mays in the head. At the end of the inning, the pitcher stormed off the mound, left the team and headed back to Boston. Mays told sportswriter Burt Whitman that he needed to make a fresh start with another team. “I’m convinced that it will be impossible for me to preserve my confidence in myself as a ballplayer and stay with the Red Sox as the team is now handled,” he said. “The entire team is up in the air and things have gone from bad to worse. The team cannot win with me pitching so I am getting out. … Maybe there will be a trade or a sale of my services. I do not care where I go.” On July 30, the Red Sox traded Mays to the New York Yankees for Allan Russell, Bob McGraw, and $40,000 in cash. The league’s owners fractured over the matter, with five franchises (Cleveland, Detroit, Washington, St. Louis and Philadelphia) siding with Johnson, while three (New York, Chicago and Boston) defied him. Because the three “Insurrectionist” clubs held control over the league’s five-man board of directors, Johnson was forced to back down from his stance on the issue, particularly after the three clubs began holding meetings with the National League to discuss the formation of a new 12-team circuit. Mays reported to New York, and the incident marked the first time in his long tenure as AL president that Ban Johnson had been outmaneuvered on a major issue. Mays pitched in 13 games for the Yankees in the second half of 1919, posting a sterling 1.65 ERA. Mays won 26 games for New York in 1920 and in 1921, he led the American League in both wins (27) and saves (7). He also hit .343 that year. Mays batted .268 over his career and, despite his reputation, was hit by a pitch just four times in 15 years — and only once after 1918. On August 16, 1920 — a dark, overcast day at the Polo Grounds — Mays hit Indians shortstop Ray Chapman in the temple with an inside fastball leading off the fifth inning. A loud crack resounded through the stadium, and Mays, thinking the pitch had hit Chapman’s bat, fielded the ball and threw it to first base. Chapman was helped off the field, but collapsed in the clubhouse; after a late-night operation on his fractured skull, he died early the following morning. As Chapman staggered off the field, Mays pointed out to the umpires a scuff mark on the baseball which he claimed had caused the pitch to sail inside. Later that day, Mays would also claim the ball was wet from the rain that had fallen earlier. A few hours after Mays was informed of Chapman’s death, he told a Manhattan District Attorney: “It was a little too close, and I saw Chapman duck his head in an effort to get out of the path of the ball. He was too late, however, and a second later he fell to the grounds. It was the most regrettable incident of my career, and I would give anything if I could undo what has happened.” Almost all other witnesses to the incident, however, reported that Chapman never moved an inch and probably never saw the ball. Sorrow over Chapman quickly turned to anger against Mays. Several teams, including the Red Sox, Tigers and Browns, sent petitions to league president Ban Johnson, demanding Mays be thrown out of baseball. Mays spent a week in seclusion, then returned to the mound on August 23. Yankee fans were supportive — a clearly nervous Mays defeated Detroit 10-0 at the Polo Grounds — but there was an increase in calls for a boycott of any game pitched by Mays. He made three starts in New York before his first appearance on the road, on September 3, in a relief stint at Fenway Park. He was greeted with a mixture of boos and cheers, but by the time he had pitched the second game of a doubleheader the following day, most of the crowd was on his side. He decided, however, to not accompany the Yankees on a road trip to Cleveland later that week. In the 1921 World Series against the Giants, Mays pitched three complete games without allowing a walk, but he was charged with two losses as the Yankees lost the series. According to sportswriter Fred Lieb, there were suspicions Mays may have lost those two games on purpose. In The Pitch That Killed, Mike Sowell details the concern among several writers and Commissioner Kenesaw Mountain Landis after Mays’s meltdown in Game 4. Sowell also quotes Yankees co-owner Cap Huston as saying many years later that Mays and others (possibly Joe Bush) had deliberately lost World Series games in both 1921 and 1922. Lieb believed the unanswered questions about those series were what really kept Mays out of the Hall of Fame. The rumors also were a likely reason that, despite Mays’s 66 wins in three years, the Yankees tried to dump him before the 1923 season. That didn’t work, so manager Miller Huggins simply refused to use him. Mays appeared in only 23 games for the Yankees in 1923, and at the end of the season was sold to Cincinnati. He pitched for the Reds for five years — rebounding to a 20-9 record in 1924 — and ended his career in 1929 with the New York Giants. After his retirement from the major leagues, Mays pitched in the Pacific Coast League and American Association for two seasons, then worked as a scout for 20 years for the Cleveland Indians and the Milwaukee and Atlanta Braves. He died on April 4, 1971, in El Cajon, California at age 79, and was buried in Riverview Cemetery in Portland, Oregon. He was survived by a second wife, Esther, and two children.